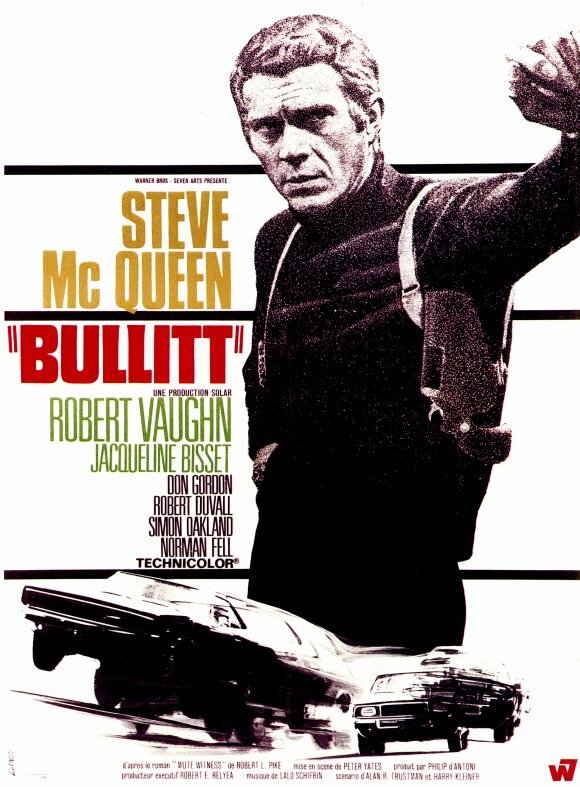 Steve McQueen’s name is Bullitt. He’s a cop, and a good cop working for good. There’s a car chase that’s very exciting but kind of unpleasant to watch, because those muscle cars don’t seem built to land comfortably after catching air going over those San Francisco hills. All in all, even just remembering those main points, it doesn’t add up to a bad movie. One non-story thing of note is that Bullitt himself works within the boundaries of the police system. Bullitt represents the kinds of by-the-book policework that movies like Dirty Harry would break away from. It’s so old hat by now for the main character in a cop movie to be a Renegade– with a capital R– who Plays By His Own Rules that it’s kind of refreshing to see a cop who, for the most part, actually works within the boundaries he’s supposed to be constrained by. Bullitt does, occasionally, work the system to his advantage, but it’s still fully within the confines of allowable police behavior. In the most prominent example, he gets a body entered in the morgue as a John Doe to temporarily suppress the identity, so that it can’t reported on until Bullitt has time to figure out whodunnit. What’s significant is that he doesn’t kidnap the body from the hospital or hide it in his car or do anything but gently game the system itself. Later fictional cops will do a lot more ridiculous stuff that’s clearly outside the bounds of regulated policework to solve a case. The investigation is the main focus of the movie, but there is a touch added in around the edge- particularly towards the end- that the brutality and death Bullitt encounters on an everyday basis is maybe not something people should get so accustomed to. It’s a good point, but the movie doesn’t care too much about making it. Fortunately, it doesn’t really need to drive home any larger points about its characters, because the cop drama is reasonably interesting and a fine basis for a movie. You don’t need to rush out to see this one, but if you have the opportunity, it’s a pretty solid late-60s cop movie with a pretty great car chase. And sometimes, that’s all you’re asking for.